Pork tenderloin and I have always had a bit of a love-hate relationship. I love to eat it, but usually when someone else is cooking it because I have a great talent for making it dry. As a result, the Southern husband looks longingly at it in the supermarket while I roll the cart right on by, heading for the good old dependable chicken. Until now. Until I realized that I could skewer it up with some bacon and some cubes of country bread and some fresh sage (side note: is there anything that smells better than fresh sage?) and grill it until everything was juicy and tender. Tender! Who knew that tenderness was just a skewer away? Start with a nice pork tenderloin (I let the Southern husband pick it out and place it lovingly in the cart, since he had been waiting eons for that moment) and cut it into roughly one inch cubes. Pop it into a bowl with some cut up bacon, a handful of bread cubes, some sage leaves, a little olive oil and some salt and pepper. Stir everything around and let it sit for a bit. Now thread everything onto the skewers in this order: bacon, bread, pork, sage, repeat. Make sure the bacon gets next to a bread cube each time. 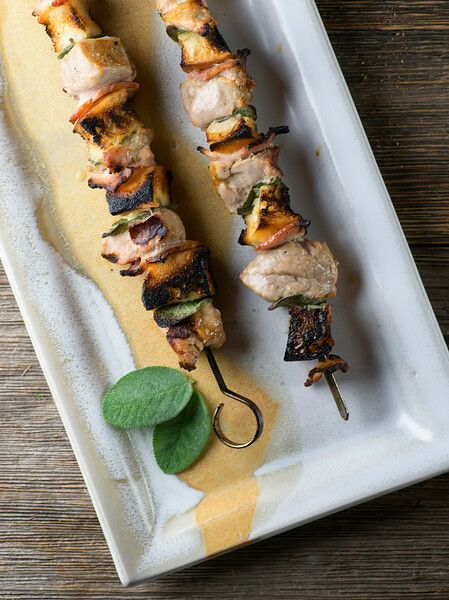 Pop the skewers on a medium hot grill and cook them for 4-5 minutes per side. I use a pair of tongs to remove the hot skewers from the grill – much neater than using oven or grill mitts. Now all you have to do is slide the perfectly tender chunks of pork along with everything else onto plates and serve it up! We had ours over rice – next time I am going to make a nice cheese polenta. Pork, we are best friends now…see you at the grill! 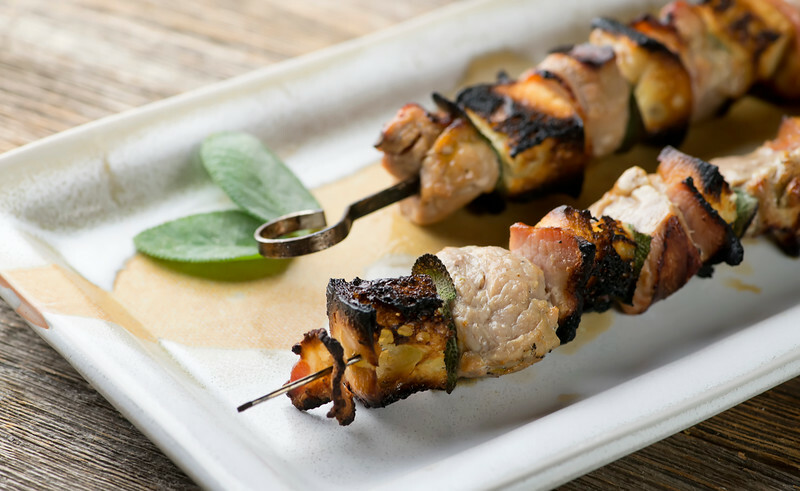 Pork bacon bread kabobs are a guaranteed way to make sure your pork tenderloin comes out juicy and tender every time! Place all ingredients in a bowl and stir together gently. Let sit for 15 minutes. Thread the ingredients onto skewers in this order: Bacon, bread, sage, pork. Repeat until skewer is full – this should fill up 4 skewers. Grill for 4-5 minutes per side. Remove carefully with tongs. Remove pork and other ingredients on to plates and serve at once.